Regardless of your skill level in ping-pong, everyone should know some of the basic rules. We hear a lot about what you can and can't do with the ball, but what about the hand that doesn't hold the racquet? Can the player, in any case, touch the playing surface? After a shot is hit, can he or she touch the surface? Putting the free hand on the table is a situation that causes lots of arguments among table tennis players. In a nutshell, the answer is "no." A player may not put his free hand on the playing surface during a rally, and if he does so he loses the point. He must wait until the point is over before he can put his free hand on the table to steady himself. Touching the Table in Ping-Pong: Yay or Nay? But it's not that easy....things get a bit tricky during these two scenarios. Scenario #1: Did the player's free hand touch the actual playing surface (which is the top of the table), or the sides of the table (which are not considered to be part of the playing surface)? This scenario usually occurs when a player brushes the table with his free hand while in the middle of playing a stroke, so there is no question that the point is still active. On occasion, a player might put his free hand on the table to steady himself while trying to reach and smash a very short, ball. In either of these cases, if the player has touched the top of the table with his free hand, the point goes to his opponent, and if he has touched the sides of the table, play should continue. Law 2.1.1 The upper surface of the table, known as the playing surface, shall be rectangular, 2.74m (9 feet) long and 1.525m (5 feet) wide, and shall lie in a horizontal plane 76cm (29.92 inches) above the floor. Law 2.1.2 The playing surface shall not include the vertical sides of the tabletop. The above situations are fairly uncommon in practice, and it is the next area which causes the bulk of the rules arguments. Scenario #2: The second situation is where a player puts his free hand on the playing surface to steady himself after he has played his stroke. In this case, there is no doubt that the player has put his free hand on the playing surface, but the question is whether the point had finished first. If the point is not yet over, you cannot put your free hand on the playing surface. The trick is knowing when the point is over! The point will be over if the rally is called a let, or a player has scored a point, as per the laws of table tennis in sections 2.9 and 2.10 of the ITTF Handbook. Player A hits the ball and starts to overbalance. Player B swings at the ball and misses, or cannot reach the ball. Player A puts his free hand on the table to steady himself.Player A must wait until the point is over before putting his free hand on the table. In this case, this means he must wait until the ball has touched anything other than the net assembly or his opponent's racket after hitting the opponent's court. Once the ball touches anything apart from the net assembly or the opponent's racket (usually the floor or a barrier), the point is over (won by Player A), and he can now put his free hand on the table to steady himself. If the ball does touch the net assembly or his opponent's racket, the point is still live and Player A cannot put his free hand on the playing surface yet. Player A hits the ball and starts to overbalance. Player B swings at the ball and makes contact, but the ball is not heading towards Player A's court. Player A puts his free hand on the table to steady himself.In this case, Player A must wait until the ball passes over his court or beyond his end line (or touches something other than the net assembly), before putting his free hand on the table to steady himself. Once the ball passes over his court or beyond the endline, Player A has won the point, and can now put his free hand on the table. If the ball touches the net assembly, the point is still live, but if it touches anything else (apart from Player A's court, of course), the point is won by Player A, and he can now touch the playing surface with his free hand. So if Player B does a big mis-hit and the ball flies off high and to the side of the table, Player A must wait until the ball goes over his court, or beyond his end line, or touches something else apart from his court (or the net), at which time the point is over, and he can now steady himself with his free hand. While the short answer to this question seems deceptively simple, we can see why there is the potential for confusion and argument in the specific situations discussed above. One more thing: the above rules only apply to the free hand of the player. It is legal for a player to touch the playing surface with any other part of his body or with his equipment, provided he does not actually move the playing surface. In theory, during a rally, you can quite legally jump on the table, lean on the table using an elbow or even just allow your body to fall on the table, provided the table does not actually move and you don't touch the playing surface with your free hand. Makes you realize why it's important to apply those wheel brakes! 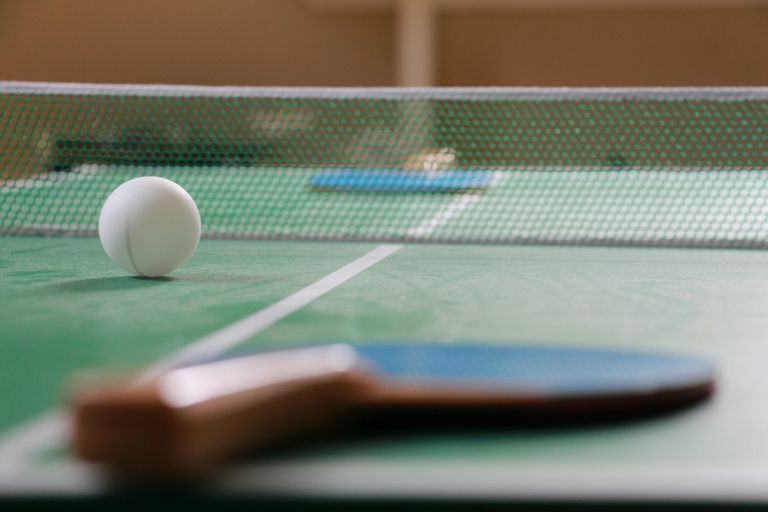 Ping Pong Rituals—Why Do Players Wipe Their Hands on the Table?